Before the 18th century, Native Americans traveled to what is now Saline to hunt wildlife and gather salt from the salt springs they found nearby. In the 18th century, French explorers discovered the area and began to harvest the salt. They named the local river Saline, which means salty in French. Europeans settled the area in the 19th century, most of them coming from England and Germany. Led by Orange Risdon, a government surveyor and the area's first settler, the residents named the town Saline, which was officially established in 1832. In 1870 railroad service, provided by the Detroit-Hillsdale-&-Indiana Railroad, first reached Saline. The city's most famous landmark is the Second Empire-style Davenport House (also known as the Curtis Mansion), which was built in 1875. 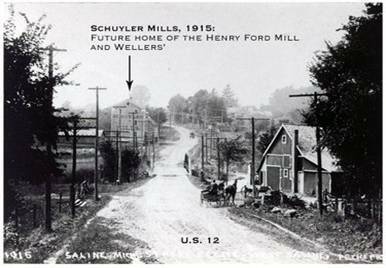 The town continued to grow, and in 1931 the Village of Saline became the City of Saline. The Saline Fisheries Research Station was built on the site of a pioneer grist mill. Through the years, Saline has been home to many interesting businesses, including a WWII-era bomber factory, a silk cocoonery, the Saline Standard Windmill Manufacturing Company, and Saline Valley Farms, a 1,000 acre cooperative which attracted struggling farm families who worked together in agricultural pursuits. Today, Saline is a charming town with restored late-Victorian commercial buildings. The community hosts a Celtic festival each year. Saline Depot Museum - This restored 1870s depot features exhibits including a furnished 1906 caboose, livery barn, windmill and walking trail. Open by appointment year round. The Bixby Marionette Exhibit - kids of all ages won't want to miss this fascinating exhibit, which features stage settings, photos, artwork and original marionette puppets handcrafted by Saline resident Meredith Bixby, whose company toured the Midwest for more than 40 years. The Rentschler Farm Museum offers a glimpse of Michigan farm life between 1900 and 1950. The museum consists of a Queen Anne-style frame house and nearly a dozen outbuildings including a restored workshop, hog house, an original 19th-century shed, equipment barn, henhouse, corncrib, upper and lower barns, a sheep barn, an ice house and a windmill. Four generations of Rentschlers lived and worked on this homestead between 1901-1998.